"Building relationships with a 'hands-on' approach"
Tony Schmidt, Teri Vincent, and her daugter Christina Hunke have stayed true to their father and grandfather. When Howie Schmidt founded his Real Estate Company in 1981, he wanted to maintain "first class" service with a personal touch. Bigger wasn't necessarily better. Teri and Tony worked together with Howie for a number of years before his death in 2004. Keeping true to Howie's desire, the brother-sister duo have resisted the temptation to add more salespeople. 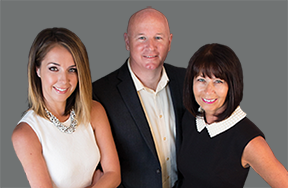 With Teri's daughter Christina's arrival she became the third generation to join the family owned realty firm. Together they adopted the philosophy "Let our family business look after your family's business". They enjoy the relationships with new and past clients and the referral clients who are as a result of a "job well done!" "We've chosen to stay this size for a reason," says Teri, who has been in the Real Estate business since 1989. "I know when I'm not here, things are taken care of. Tony knows my clients and their homes and vice versa...that's important to our clients because they want continuity and they want the job done!" Tony adds, "people like the fact that they are dealing with the owners of the company, we don't have to check with the head office when an important decision has to be made - we're the head office!" Tony, Teri and Christina are proud working under the family banner which Howie founded and built. And, they have stayed true to his wishes. They strive to be very "hands on" with their clients. "Our reward is the reaction we get from the seasoned Seller getting their price or the excitement of the first-time Buyer obtaining their dream home", says Tony. "We really love what we're doing", says Teri, "it's a business that allows us to build relationships that last a lifetime". Howie's reputation in the industry has left "big shoes" to fill. "Dad had a reputation built on respect and integrity, two qualities very hard to obtain, but easy to lose. It is something we are conscious of every single day", says Tony. Howie Schmidt Realty Inc. Brokerage (HS Realty) was built on the principle of “hard work with a personal touch”. This was the objective Howie Schmidt had when he founded the business in 1981, and he passed this mentality on to us. Working with Dad for many years, we have continued to stay true to him, adopting his philosophy “let our family business look after your family’s business”. We are proud to work under our father’s name and the company he built. 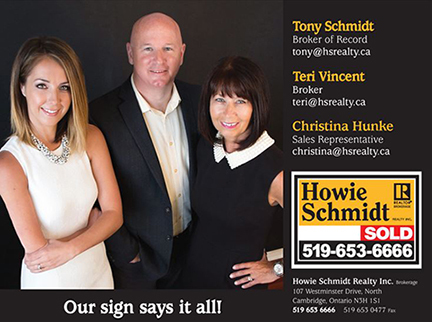 On the business side, Howie Schmidt Realty Inc. Brokerage is a member of both the Real Estate Board of Cambridge and the Kitchener-Waterloo Real Estate Board to give maximum exposure to the properties they have for sale.